If you love olives like I do then this tapenade olive spread on garlic toast is going to be your favorite appetizer ever! I love it chunkier than the normal spreads but you can make it a smooth spread just leave it longer in the food processor You will be hooked like I am if your an olive lover! This is a delicious olive appetizer. The spread goes great on garlic bread or flavored crackers of any kind. 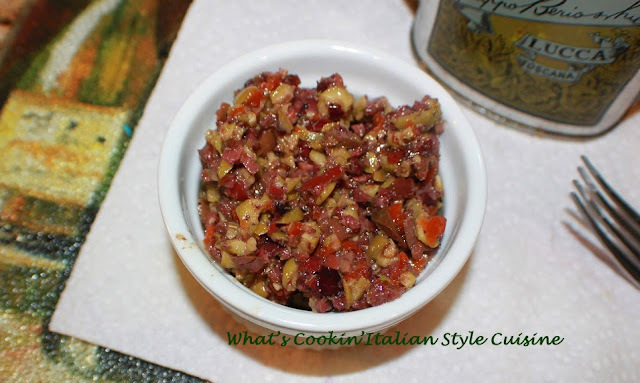 Olive spread tapenade appetizer, is famous in established gourmet Italian restaurants, now you can make it at home. You can use any assortment of olives. I love oiled cured Italian black olives, they always have pits in them and have to be removed. The green large Italian olives sometimes I buy with hot pepper flakes on them and use those as well. You can use whatever you like as suggested in the recipe. Add everything but the capers and basil, into a food processor then pulse around 6 times or till desired chunkiness. Stir in the capers. For garlic toast, just drizzle olive oil on sliced Italian bread, sprinkle with garlic powder and oregano, a little grating cheese and bake on 450 degree for around 6 minutes watch it doesn't burn. Cut slices into 4 pieces and spread the garlic bread with the olive appetizer. Spread on toasted Italian garlic bread. We love olives so this is a must try! Thanks, Claudia! 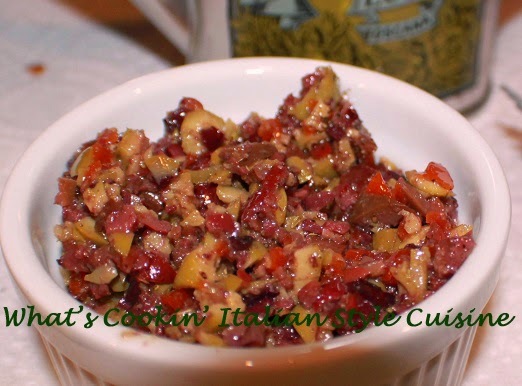 You can never have too many tapenade recipes! Love the spices in this!